Back in 2013, modern-day Iron Man Elon Musk unveiled his concept for a high-speed transportation system he described as a cross between a Concorde, a railgun, and an air hockey table. 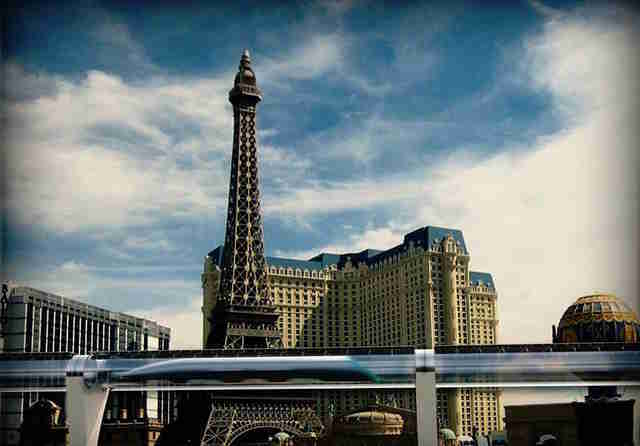 Dubbed the "Hyperloop," this futuristic train would theoretically be capable of catapulting passengers at supersonic speeds, up above ground, inside giant tubes. It seemed a little pie-in-the-sky then, and it's still widely misunderstood, so we checked in to see how much progress has been made, and how close we are to ping-ponging cross-country in a flash. 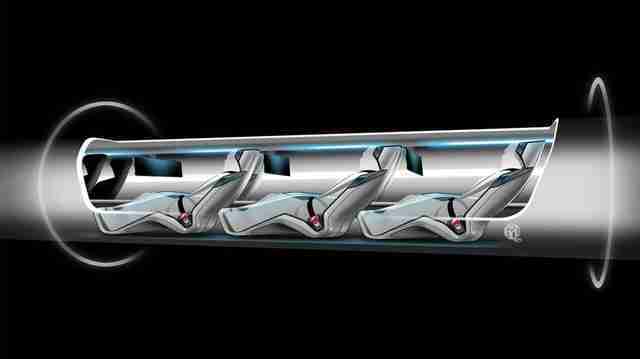 As outlined, the Hyperloop would be capable of traveling faster than the speed of sound. To put that in perspective, a trip on the Hyperloop from LA to SF -- the route initially proposed by Musk -- would take just 35 minutes, compared to a six-hour drive, or hour-plus commercial flight. If you assume a straight line and no stops, that would mean a trip on a Hyperloop track between LA and New York would take just three hours, or approximately one viewing of The Wolf of Wall Street. 2. The passenger pods float inside giant steel tubes using magnetic pressure You know those pneumatic tubes at the bank drive-up window that you use to shoot the teller your deposit slip? Imagine that, but big enough to fit a couple dozen passengers, and you've got the right idea. Musk's plan involves using magnets to propel aerodynamic capsules (where the people will sit) through giant steel tubes, sidestepping any friction by keeping it afloat on a constant pressurized cushion of air. Based on Elon Musk’s track record, you’d be silly to underestimate him. 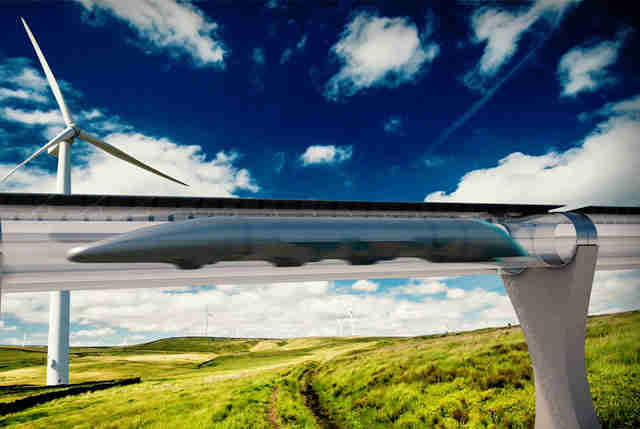 However, it’s pretty wild how close we are to seeing a real, live Hyperloop in action. Just last month, Musk’s aerospace company SpaceX hosted a competition of 120 teams of high school and college students, challenging them to come up with innovative Hyperloop pod designs (MIT took the top spot, by the way). Additionally, the construction of test tracks in California and Nevada is underway, where the students will test their pod designs later this year. One of the biggest draws for a Hyperloop, besides speed of course, is that it would be eco-friendly and self-sustaining. The design, as outlined by Musk, involves topping the steel tubes with solar panels, which store the energy that powers the air compressors that cushion the pods, as well as other vital components. 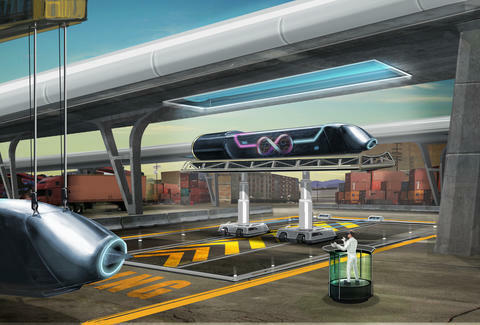 Enough energy would be stored so that even at night or in cloudy weather the Hyperloop could continue operating normally. Humans can only handle about 0.2 Gs of acceleration up and down or side to side without turning into walking, talking vomit machines. So essentially, if this thing is rocketing at 800 miles per hour, it will be crucial that it travel along a straight fixed plane. No tubes could go down into valleys or up and across mountains; that means carving a lot of tunnels and constructing giant pylons, which would be hugely expensive. And even under the optimal conditions, moving about the cabin would be incredibly dangerous, especially if it needed to suddenly slow down. 6. Minor malfunctions would be catastrophic When you’re catapulting inside a windowless vacuum at supersonic speeds, even the slightest disruption to the air around it is game over. There would be airplane-style oxygen masks that drop down in the event of a loss of pressure inside the pod, but what about an unexpected jolt from outside the tube (an earthquake, freak explosion, etc.) that cracks the facade? Or what if any of the air compressors that cushion the pod fail? Either of those scenario ends with an out-of-control, train-sized bullet violently bouncing off the walls. That would be bad. 7. But Musk insists it's the safest "fifth mode of transport" Despite these safety concerns, Musk maintains that the Hyperloop would still be much safer than the four alternatives -- trains, planes, cars, and boats. Beyond the general convenience of efficient, high speed travel, the Hyperloop would be immune to dangerous weather conditions like fog, ice, rain, or snow, helping to relieve major cities of congested traffic jams and accidents. Musk isn't the only one working toward a Hyperloopy future. In fact, when he first outlined the idea back in 2013, he acknowledged that he was way too busy (you know, with his plans to colonize Mars) to dedicate himself fully to the project, and invited other brainiacs to join the effort. Using a platform called JumpStartFund -- essentially a Kickstarter for big ideas, big investors, and big money -- a group of eager engineers founded Hyperloop Transportation Technologies. That caught the attention of some big names in Silicon Valley (including an Uber investor, a former SpaceX engineer, and the manager of Obama’s 2012 re-election campaign), who banded together on their own to form Hyperloop Technologies. According to Musk and others, the Hyperloop route between LA and San Francisco would cost roughly $6 billion to build, which is nearly one-tenth the overall cost of the high speed rail service California has planned. When you put that in perspective with the Hyperloop’s 35-minute one-way trips (compared to the high speed rail’s 180 minute predicted trip time), it sounds like an even more attractive plan. Washington loves a moonshot project, and from the sounds of it they’re totally onboard with making the Hyperloop happen. Speaking at the pod design competition last month, US Secretary of Transportation Anthony Foxx declared it a “very solid idea” and followed by saying the government has a responsibility to back its innovation and potentially even help fund it. Considering all the required regulations and red tape involved in turning the Hyperloop into a viable mode of transportation stateside, many experts argue that the first real example of a functioning Hyperloop may end up in places that “don’t have a deeply embedded transportation network.” Hyperloop Dubai anyone? There are in fact rumors that China may be considering building one between Shanghai and Beijing. Joe McGauley is a senior writer for Thrillist. He'd need to be unconscious in order to avoid having a panic attack on one of these.